Conrad van Alphen is known as much for entrepreneurial spirit and depth of preparation as he his is for performances that combine exceptional sensitivity, vision and freshness. He enjoys a particularly close association with the Russian National Orchestra and is currently an artist of the Moscow Philharmonic Society, in which capacity he regularly conducts the major Moscow orchestras and many more throughout Russia. For four years he was chief conductor of the State Safonov Philharmonic Orchestra. At the turn of the new millennium, Conrad founded Sinfonia Rotterdam, of which he remains chief conductor and artistic director. 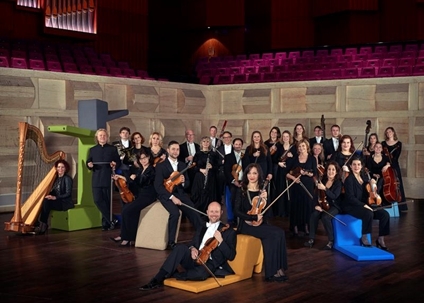 The orchestra presents concert series at de Doelen in Rotterdam, at the Nieuwe Kerk in The Hague and at the Royal Concertgebouw in Amsterdam. Under Conrad’s leadership, it has become an internationally recognised ensemble, has made acclaimed recordings, and has toured Mexico, Brazil, Columbia Chile and Russia. As a guest conductor Conrad works with some of the world’s most respected orchestras, such as the Montreal and Svetlanov Symphony Orchestras, the Brussels, Bogota and Moscow Philharmonics, the Bochumer Symphoniker as well as the Symphony Orchestra of the Gran Teatre del Liceu in Barcelona. 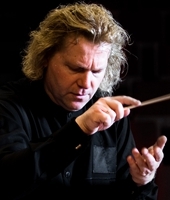 Next to being an accomplished symphonic and opera conductor maestro Van Alphen is highly regarded for his interpretations of cantata, mass and oratorio such as Orff's Carmina Burana, Handel's Messiah and the Requiem masses of Faure, Verdi and Mozart. Conrad was born in Pretoria, South Africa, in 1963. After concentrated music studies he moved to The Netherlands at the age of 26, where he joined the double bass section of the Radio Symphony Orchestra, Hilversum, and the Beethoven Academie, Antwerp. He studied conducting with Eri Klas and Roberto Benzi. Synchronous to the energy and intensity of the large port city, Sinfonia Rotterdam brings the music of classical masters to a large audience in a dynamic, penetrating way. During performances in concert series in Rotterdam, The Hague and Amsterdam, and on the many national and international stages, Sinfonia Rotterdam, led by the enthusiastic conductor Conrad van Alphen, knows how to involve the audience in the musical experience. Based on the classics of the 18th century, the orchestra organizes in combination compositions from all later periods. By even linking the old masters to world premieres, Sinfonia Rotterdam always captivates with new colours and contrasts. Through an expressive implementation style, Sinfonia Rotterdam brings energy and intensity to old and new works. Sinfonia Rotterdam distinguishes itself through its active way of making music, which gives the orchestra a young, energetic look. During performances, Sinfonia Rotterdam manages to involve the audience in the musical experience under the guidance of the enthusiastic conductor Conrad van Alphen. During the concerts an intimate, personal atmosphere is created through which the audience feels involved with the orchestra. 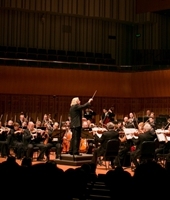 In special series, Sinfonia Rotterdam is flanking a top performance with informal receptions before and after the concert, during which, while enjoying fine wines and live background music with conductor and musicians, the orchestra creates a low-threshold atmosphere and knows this way to interest new audiences in classical music and to bind to them. Conductor Conrad van Alphen himself introduces the works before or during the concerts, which also contributes to the intimacy of the concerts. The series "Classic & Wine" is now a concept in Rotterdam, The Hague and surroundings. In Rotterdam the orchestra organizes the series “Classics & Wine” in the Wereldmuseum and de Doelen and in The Hague the audience can enjoy the series Classics & Wine in the New Church. The orchestra makes an annual tour through the Netherlands. The orchestra tours from Terneuzen to Heerlen and from Groningen to the Concertgebouw in Amsterdam. Sinfonia Rotterdam can be heard in the many concert halls of the Netherlands, but also at outdoor concerts and at other special locations the flexible Sinfonia Rotterdam is a regular guest. Sinfonia Rotterdam feels at home everywhere. In recent years, the orchestra received standing ovations in St. Petersburg, Novosibirsk, Karelia, Bogota, Santiago de Chile, Curitiba, Vitoria, Rio de Janeiro and Sao Paulo, and toured Brazil in 2018. Sinfonia Rotterdam has made recordings under prestigious labels such as Channel Classics, Talent Records and Telarc, about which beautiful reviews have been written, including in the renowned magazine Gramophone.